Image from Mark Bellairs (Ancestry.com). Reproduced by permission from Tim French. Martin James French was born in Orange on 17 December 1877 to Nicholas and Mary French. In 1899 he was working as a barman in the Federal (later Empire) Hotel, which belonged to his father. Between 1903 and 1908 Martin lived in Kalgoorlie in Western Australia, where he worked for a time as a tram conductor. 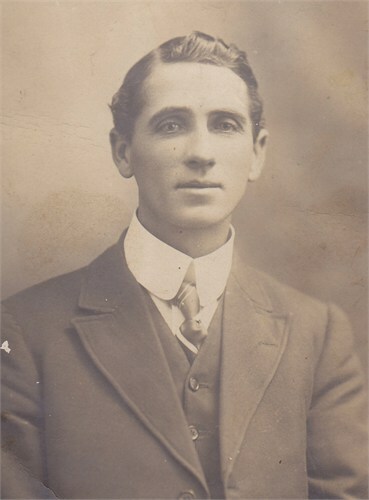 Martin was living in Sydney and working as a salesman when he enlisted in January 1916. On entry to the AIF, he was appointed to the Reinforcements Field Company Engineers 2nd Military District (2MD), at the Engineers Depot, Moore Park, Sydney, and remained there under training until February 1917. He embarked from Melbourne on 10 May 1917, onboard Clan McGillivray and received 72 hours detention for “breaking ship” while the ship was in Fremantle. Martin disembarked at Plymouth on 25 July 1917 and marched into Camp Parkhouse, near the village of Shipton Bellinger, later that month. Martin undertook further training at the Australian Engineers Training Depot (AETD) in Brightlingsea in Essex from August 1917 to February 1918, and on 7 March 1918 was marched out to the Australian Infantry Base Depot (AIBD) Rouelles, France, with the rank of Sapper. Sappers (engineers) were essential to the running of the war. Without them, other branches of the Allied Forces would have found it difficult to cross the muddy and shell-ravaged ground of the Western Front. Their responsibilities included constructing the lines of defence, temporary bridges, tunnels and trenches, observation posts, roads, railways, communication lines, buildings of all kinds, showers and bathing facilities, and other material and mechanical solutions to the problems associated with fighting in all theatres. On 10 March 1918, Martin was “taken on strength” with the 12th Field Company, Australian Engineers “in the field”. He served with the 12th FCE for over a year, near places such as La Nouvelle, Amiens, Villers-Brettoneux and Gentelles. A month by month account of the Australian Engineers war diaries has been digitised by the Australian War Memorial. The diaries provide a wonderful testimony to the ingenuity and initiative of Australian engineers during the War, and the daily difficulty of building and maintaining structures and machines to ensure the success of the war effort. Martin returned to England from Chaumont, France in April 1919 for leave and to prepare for “RTA” (Return To Australia). He eventually left England onboard the ship City of Exeter on 12 July 1919, arriving in Sydney on 26 August 1919. After the war Martin moved to Westbury in Tasmania, where he worked with his brother Tom, first as a store manager and then as a traveller. In 1928 he relocated to Wagga Wagga, NSW where his three sisters lived, and in 1933 married Elizabeth Scott. Martin also served in World War II. He died in Wagga Wagga in January 1954. His obituary in the Daily Advertiser stated that he was a keen sportsman who was a member of the town’s 1st AIF cricket team. He was also a well-known bandsman. Representatives from the local RSL attended Martin’s funeral; one of whom sounded The Last Post on his bugle. This entry was posted on August 8th, 2014.